Avatar: What Ever Happened to Zuko’s Mother? Perhaps one of the most burning questions amongst Avatar: The Last Airbender fans was a question posed at the end of Book 3, where Zuko visits ex-Fire Lord Ozai and prison and asks, “Where is my mother”. Fans were outraged that one of the most interesting stories within the series was left open-ended. However, unbeknownst to many, the story of Avatar: The Last Airbender has been continuing in the form of a graphic novel series. One of the most recent story arcs, a 3-part series entitled Avatar: The Search finally revealed the whereabouts and backstory of Zuko’s mother, Ursa. Keep reading to find out what happened! First, I’ll give a little backstory on the graphic novels. 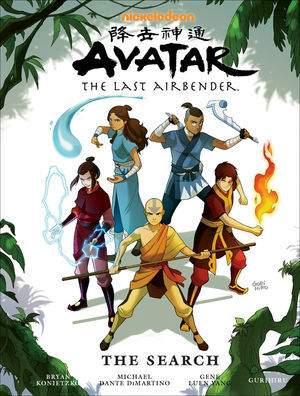 There is one single arc entitled Avatar: The Last Airbender- The Lost Adventures, which is just some additional stories about Team Avatar set in the time period before Aang defeats Fire Lord Ozai. Next, there is a 3-part story arc entitled Avatar: The Promise, which takes place directly after the events of Aang defeating Ozai. 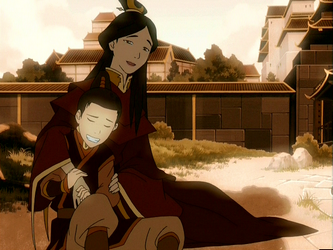 Upon announcement of The Promise, fans thought this would have the Zuko’s mother story. Instead, this focuses on Aang’s promise to redivide the nations to restore peace. However, this causes some issues because some colonies that have a mix of different benders have been living happily for generations. I won’t go too much further into The Promise, but it ends with Zuko approaching a mentally-unstable Azula and asking her what she wants in order for her to coax the information out of Ozai as to what happend to their mother. At the start of The Search, we meet a pre-Ozai Ursa (who is considered one of the most beautiful women in the village), and discover that she is madly in love with her boyfriend, a nice boy named Ikem. The two live in a Fire Nation village together and one day, Ikem proposes to Ursa and they are both ecstatic. However, upon Ursa’s return home, she finds Fire Lord Azulon and Fire Prince Ozai at her home. 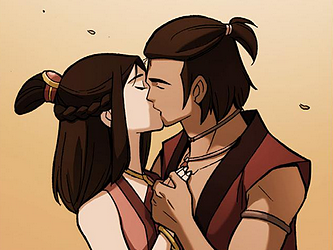 Ozai then proposes to Ursa, and because he is the Prince of the Fire Nation, she cannot really say no. She leaves to go live at the Fire Nation Capital, breaking Ikem’s heart in the process. Ikem then flees into a forest called Forgetful Valley. Fast forward to Zuko and Azula being children. Ursa is very unhappy in her unhealthy relationship with Ozai. She has secretly been using one of the maids to send secret letters to Ikem back at their old village. Little does Ursa know, but the maid is secretly working with Ozai to intercept all of the letters. It is revealed that one letter in particular has some important information, but we are unsure as to what the information is. Fast forward to Zuko now being Fire Lord and balance being restored to the nations. A very hesitant Zuko has recruited the help of Azula to find Ursa. Azula’s only stipulation is that she can help them ‘with dignity’, which basically means being free of chains or a straightjacket. Azula and Ozai have a long, private coversation, which Zuko allowed in order to get information from Ozai. After the converstion with Ozai, Azula escapes her straightjacket (she has not been released quite yet) and rushes into a secret room that Ozai told her about. Zuko, in pursuit, finds her with a handful of letters…the same letters that Ursa attempted to send to Ikem! She quickly burns the letters in front of Zuko, ensuring Zuko’s cooperation since Azula has read the letters and he believes they contained important information regarding Ursa’s whereabouts. Similar to the television series, Azula continues to have mental visions of Ursa saying things like “I have always loved you”, pushing her mental reliability to the brink of disaster. Zuko requests a visit from Team Avatar and enlists the help of Aang, Katara, and Sokka to also help in the quest. As revealed in The Promise, Toph has started a metal-bending training academy, and it is said she is busy training earthbenders how to bend metal and is not featured in any of The Search books. The gang hits a few issues traveling with Azula, who wants to seek revenge on their mother for ‘intentionally hating her and wanting to bring her down’. We discover that somehow, Azula has something up her sleeve that would give her the Fire Nation crown. Azula tries to escape, but Katara is quickly able to encase her arms in ice to subdue her. A mysterious wolf spirit, with a suspicious face-like design on its chest, appears and the gang quickly finds themselves outmatched. Azula offers to help and Zuko reluctantly agrees. To their surprise, Azula manages to help save the crew with her lighting as the wolf spirit evaporates into a hoard of flying insects. While at camp one night, Zuko attempts to bring Azula a blanket and discovers a mysterious piece of paper tucked into her boot. Zuko takes and reads the letter, which reveals something incredibly important: Zuko’s parents are actually Ursa and Ikem, not Fire Lord Ozai! It all makes sense now, this is why Ursa always favored Zuko and pushed Azula away. This letter is Azula’s secret fact because she is now rightful heir to the Fire Nation throne, and it is also revealed that this is the same letter that the maid intercepted to show Ozai. We see a short seen of Ozai confronting Ursa about the letter and some important facts are revealed. First, Ozai is furious and tells Ursa that he sent an assassin to kill Ikem. Second, we discover that Ozai requested that the Fire Nation Sages revoke Iroh’s birthright to the throne. The reason being is that Iroh just lost his son, Lu Ten. Since Ozai still has children, the birth line of the Fire Nation throne will be secured. Azulon was furious at his son, Ozai’s request, and forces him to “get rid of” Zuko so Ozai can feel the pain of losing a first-born. Ursa is able to strike a deal. She agrees to leave the Fire Nation for good and give Ozai the recipe for a colorless, odorless poison (Ursa’s mother was a master herbalist) in exchange for the safety of her Zuko and Azula. Ozai agrees to the offer. Azulon mysterious dies that night and Ozai is able to secure the birthright. Team Avatar and Azula travel to Ursa’s old village and meets one of the few people who used to know Ursa. His name is Noren and he invites the gang to his home to meet his wife, Noriko. Noren and Noriko have been happily married for a few years and even have a young daughter. They praise Aang and Katara for finding love so early, as love for them came later in life. The two explain that nobody has heard of Ursa or Ikem since their disappearances. But, it was rumored that Ursa returned to the village and wandered into Forgetful Valley in search of Ikem. Forgetful Valley is a gigantic and disorienting forest, but there are four sacred pools of water found within it. 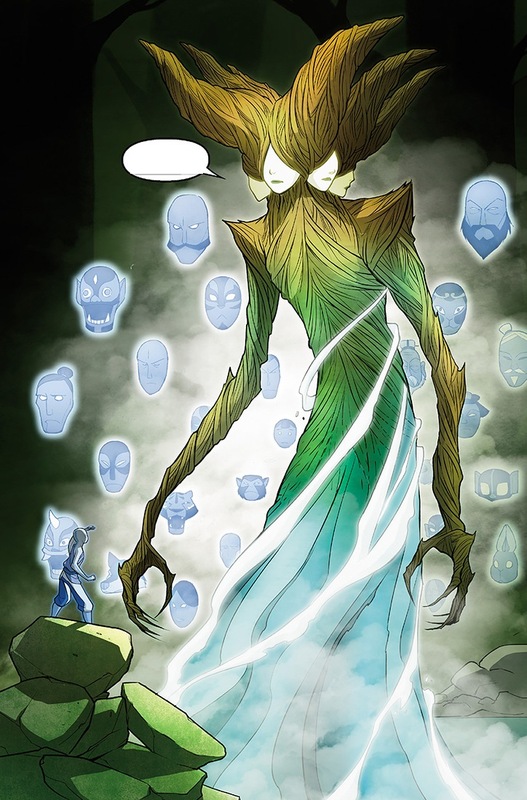 Team Avatar travels into Forgetful Valley and discovers that the same face-like design on the wolf spirit’s stomach is also visible all over the forest. The team meets a brother and sister in the forest who explain that the wolf spirit, on occasion, will drink from a pool of water, which signifies which pool a giant spirit will emerge. The brother and sister are in pursuit of this spirit because the the brother had his face stolen from Koh the Face Stealer. A spirit, the Mother of Faces, emerges from the pool and explains it has the power to grant a new face to a human. Azula is now missing and Zuko knows where she went. The two flee along with Sokka. For the sake of brevity, once the Mother of Faces realizes that Koh stole the brother’s face, she grants him a new one. Koh is her son and the two have not seen each other for quite some time. It all comes together. Azula figured it out slightly earlier, but Noren and Noriko are actually Ikem and Ursa. When Ursa left the village to marry Ozai, Ikem went and got a new face to start a new life. Ursa returns, and Ikem/Noren are reunited. He takes Ursa into Forgetful Valley and she also gets a new face. We find out that Ursa requested that the Mother of Faces wiped her memory, so she has no remembrance of her prior life as they were too painful to bear. However Ikem/Noren still has his memory. Zuko takes a shortcut to get to his parents first, and reveals he is their true son. Azula then tries to attack the family, but Zuko is able to stop her. After a long battle, Noriko apologizes for not loving Azula enough, even though she has no recollection of what that means. Azula flees into Forgetful Valley and that is the last we hear of her. The Mother of Faces then appears, asking Noriko if she wants her memory back and she agrees. Zuko inquires about his true father and we discover that Ikem is not Zuko’s father. Ursa only wrote that letter to see if the maid was actually intercepting them. We then see the remainder of ‘the deal’ that Ursa and Ozai made. Ozai knows that Zuko is his son, but upon Ursa agreeing to leave for good, he says that he will basically treat Zuko poorly as a testament to Ursa’s treachery. Ursa agrees to tell Zuko everything, and the story ends with the two walking off together. Thanks for reading! Hopefully this sealed up any loose ends to the story. It is also revealed at the end that a new Avatar graphic novel story will be coming in March, entitled The Rift. Stay tuned!